The fracturing of our attention — and the redefinition of mass-market. 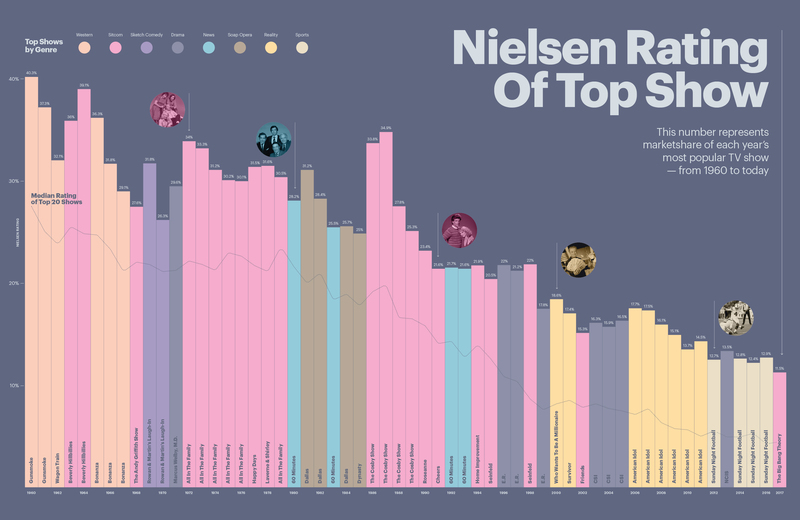 That says less about “Mad Men” than about just how much the definition of a hit show has changed over the past six decades. The top-rated show in 1960, “Gunsmoke,” had millions more viewers than last year’s biggest hit, “The Big Bang Theory,” even though there are three times as many TV households now. “Gunsmoke” was seen by a full 40.3 percent of the viewing population while “The Big Bang Theory” got just 11.5 percent, according to Nielsen’s annual season ratings. It doesn’t take a “Big Bang” math whiz to see that the slice of viewership today’s shows reach is shrinking faster than the overall pie is growing. Before the turn of the century, NBC could predict hits using what company executives called the 40-40-20 test, Thompson says. During a show’s marketing blitz, the network knew it had a hit on its hands if 40 percent of survey respondents had heard of it, 40 percent of that 40 percent wanted to see it, and 20 percent of those who wanted to see it really wanted to see it. 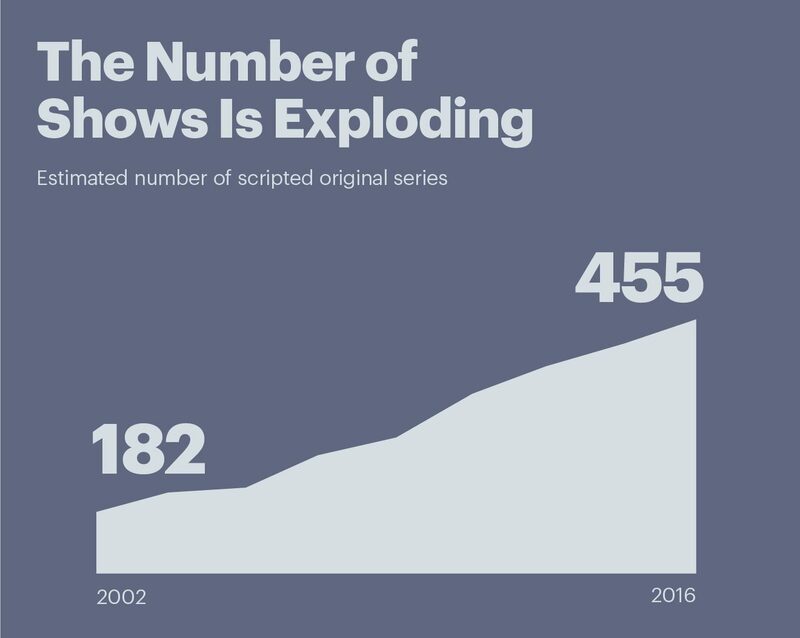 One reason: The number of scripted TV shows is exploding. In 1992, after cable television was established, Bruce Springsteen sang about “57 Channels (And Nothin’ On),” but The Boss didn’t have Netflix originals. By 2002, 182 scripted series were being created for U.S. television, according to research by FX Networks. By 2016, that had more than doubled to 455. 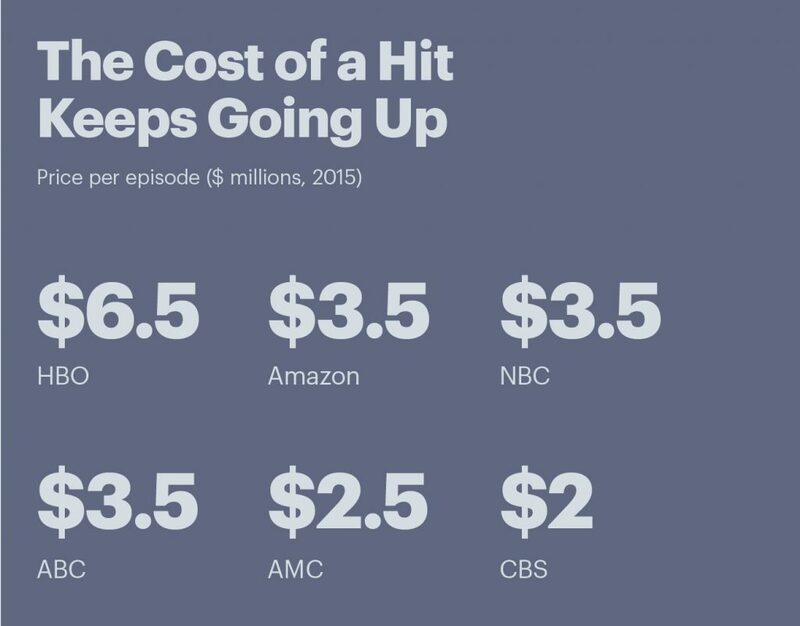 Include non-scripted series like reality TV and game shows, and the tally of primetime shows jumps to over 1,400 per year. It’s a strategy Netflix has racked up more than $20 billion in debt chasing. And that incredible investment in content has helped drive up the price tag on a tent-pole show. In 1965, when “Bonanza” was at the top of the TV heap, it cost $133,500 per episode to produce (a little over $1 million in today’s dollars). “The Big Bang Theory” costs in the neighborhood of $10 million per episode. Put another way, “Bonanza,” in its heyday, was attracting around an estimated 18 viewers for every inflation-adjusted dollar spent. “The Big Bang Theory” attracts an estimated viewer or two per dollar. Paid streaming services that cater to niche audiences — like WWE’s aimed at wrestling buffs or Crunchyroll’s service for anime fans — have racked up seven-figure subscriber bases in recent years. And Netflix’s plan to turn everyone into a subscriber relies on producing shows that have particular appeal to specific audiences — it’s a mass market subscription composed of niche offerings. This movement from mass market toward niche is not exclusive to television. With millions of articles and videos published online each day, consumer media diets as a whole no longer overlap to the degree they once did. A growing share of consumers haven’t even heard of, much less watched, many of the top shows on television. The trend also means a premium has been placed on content that fans love rather than like. No matter how the economics of the TV business shake out over the next couple of years, the renewed emphasis on the viewer — on creating shows for someone rather than everyone — is likely to remain a key part of the formula for future hits.